Mega Man meets Mario meets Street Fighter? 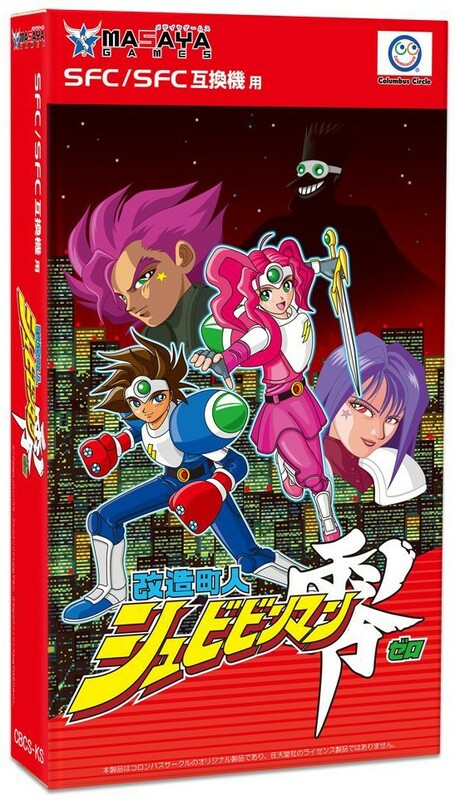 Technically known as BS Kaizou Choujin Shubibinman Zero, this franchise (known as Shockman in the US) had a one-off entry for the 16-bit SNES. Sadly, it never came out officially. 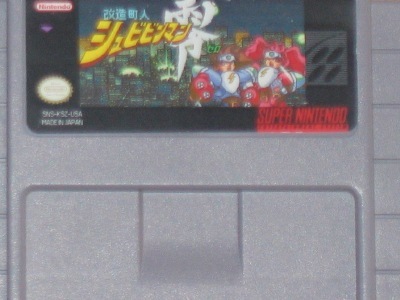 It was released only through the Satellaview in Japan. But now thanks to time and technology, back in 2010 I was able to get this on an actual cart. Some call it Schbibinman or Tyoujin — not Choujin. However you want to spell the title, what matters is the game itself. And thankfully, Kaizou offers more than enough to make itself noteworthy. Back in the day, EGM had a sweet import section they called International Outlook. 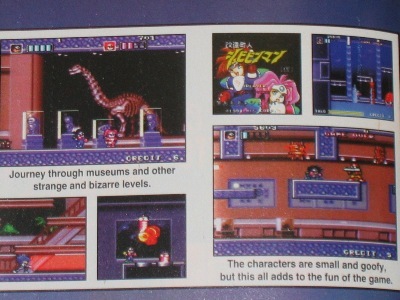 Each month they would highlight a select small handful of Japanese games. It was in issue #61 that I first found out about this game — way back in summer of 1994. Right away I was intrigued and wanted to play it badly. I figured it would only be a matter of time before it came out to the US. Sadly, that never happened. Time went on and I forgot all about it. Fast forward to January 2006. I got back into all things SNES and did so with a vengeance. Buying games left and right, crossing want after want off the ole, er, want list… and basically reclaiming bits and pieces of my childhood. 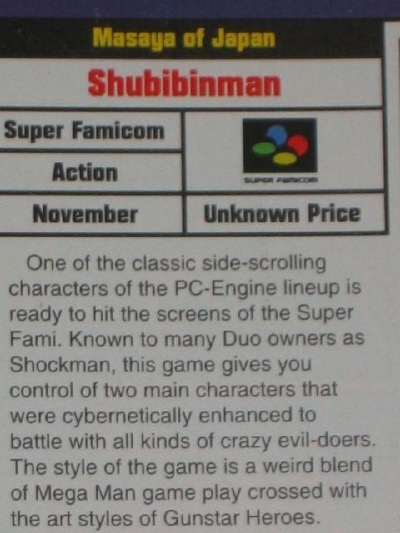 I remember searching for Shubibinman on the Super Famicom scene to see whether or not it slipped under the radar. Imagine my horror when I realized it never came out. But thank God for repros, eh? It’s a great opportunity for us to play the ‘lost titles’ of our youth! Nothing’s sweeter. Perhaps the coolest thing about BS Shockman is its 2-player mode. Unlike most other 16-bit 2-player games, this one added in a little twist. You can pull off techniques that you cannot otherwise do when playing alone. Our heroes, Raita and Azuki, can charge up for a super blast. If one of them hits the other with their super blast, then that gives the other player a split second to launch an all-out attack of epic melee proportions. It’s quite awesome! Best of all, the charging only takes about a second, much less than Mega Man. Nice. 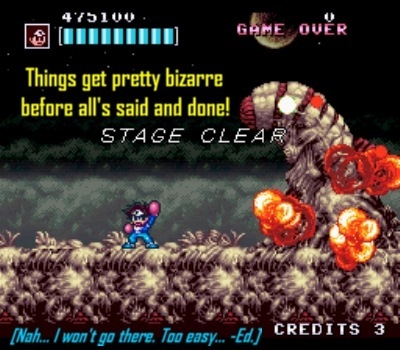 I would have loved to seen this as an actual stage in the game, but sadly it is only used as a set piece for the intro. There is quite a bit of platforming to do which gives the game a nice mix between a platformer and a good ol’ beat ‘em up. Lots of tiers for you to jump on or down from. NCS did an excellent job splicing these two genres because neither aspects ever feel out of place. 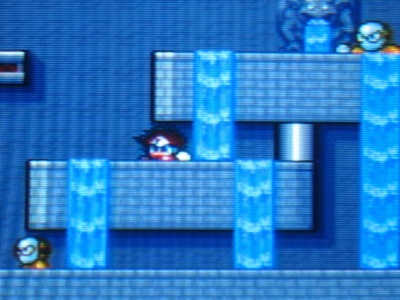 The putty variant with the gun presents much more of a challenge and later stages like this one even have obstacles in the playing field. 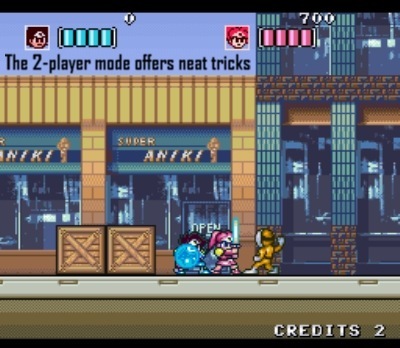 At times it almost feels like you’re playing Super Mario Bros. with a little Mega Man and even a dash of Street Fighter thrown in for good measure. I really enjoy the different bosses this game throws your way. Some are just people, like you’d see in a beat ‘em up, while others are massive mechanical monstrosities, like the sort you’d find in a platformer. It all goes back to NCS mixing in the two classic genres seamlessly. 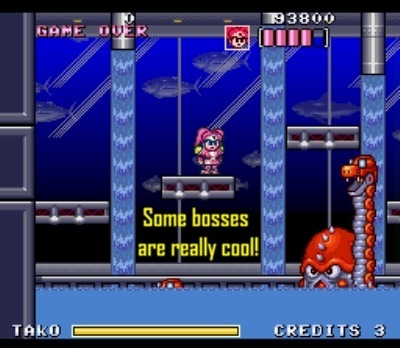 This strange and compelling octopus boss fight, complete with snakes for tentacles, comes to mind. Jumping from different platforms, avoiding the snakes’ red bullets and smashing the octopus’ head in is nothing short of sweet and satisfying. The stages are somewhat short and there are only about 8 of them, but they vary in locale and look. 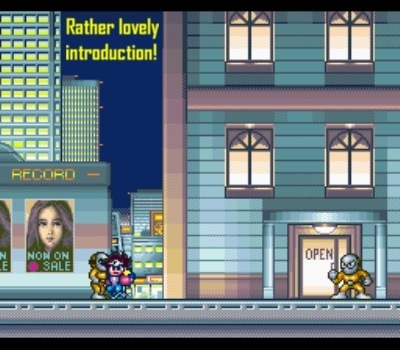 Most BS Satellaview games didn’t have the most elaborate of graphics (as compared to traditional SNES releases of its time) and it’s the same case here. However, I still like it. It’s bright and colorful enough to present me with a real gaming world, yet not so souped up that it destroys the illusion of playing a video game. Wait, is that an alien pe… nevermind. You start out with four life bars and four continues. As you progress, you can level up and gain more life bars. 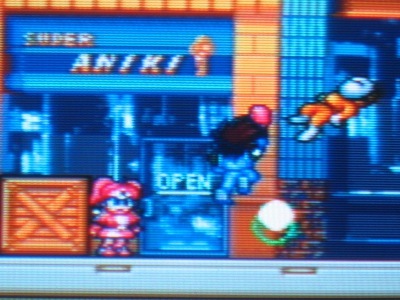 The game starts out in the city before going underground and then finally to outer space. It’s all quite a wild, fun-filled ride. It’s not too difficult and can be beaten in well under an hour. But hey, not every game needs to be super long. Games like this, which only require 45 minutes or so, are a great break from the RPG norm. 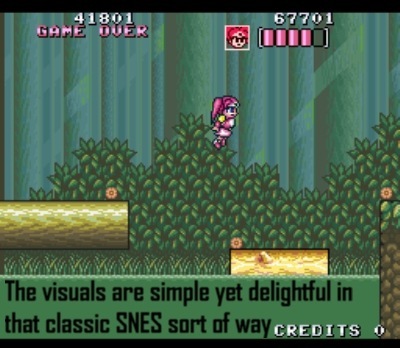 For my money, the SNES did it best! But not left for dead today! Note: It’s an official release as of summer 2017! With its fun gameplay mechanics and bizarre sights, BS Shockman is a winner. It never wears out its welcome and I find myself coming back to it randomly for the odd go-through. Each time I have a blast. There’s something simple and very charming about it that I really enjoy. The boss fights are varied and it helps to keep the flow moving along. 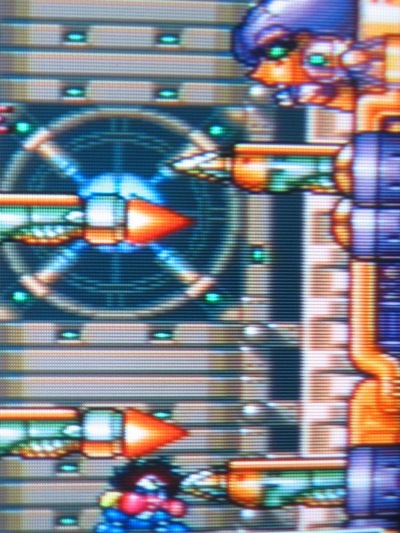 One boss launches needle rockets at varying heights, forcing you to ascend to the top in order to knock some health off. Being able to duck, run and jump at will with no control issues is part of what makes it so fun. Another boss fight has you dodging explosions while hitching rides on precarious floating balloons. It’s not all mindless button mashing. The platforming aspect of this game really suits it well and makes it a cut above the norm, since there is some actual thinking and plotting to be done here! BS Shockman uniquely blends different aspects from a variety of classic franchise games. There’s some Mario spliced in with a little Mega Man, some Street Fighter, even some Castlevania. It’s all mixed in with a spot of humor (i.e. 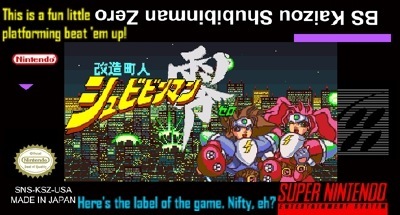 see the Super Aniki background which refers to NCS’ Cho Aniki series) and some rocking tunes, not unlike what you might hear from a Mega Man title. I highly recommend this game to all SNES fans. 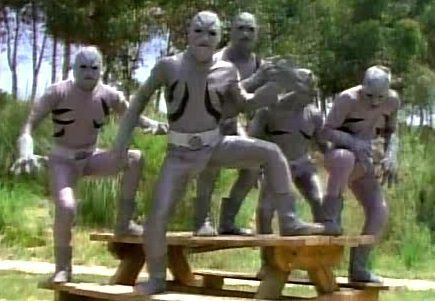 It’s obscure, it’s fun, it’s wacky and it’s a blast with a friend. It’s a true shame when drivel like Rise of the Robots gets put out and fun little games like this are lost to time and politics. Thankfully though, technology allows us to restore and experience otherwise lost gems. While this isn’t a OMG-you-gotta-drop-everything-and-play-this-now!! kind of game, it’s definitely something Super Nintendo fans will want to seek out if they haven’t before. It’s not perfect, but it’s the perfect kind of game to play when you’re hankering to get back to the basics. 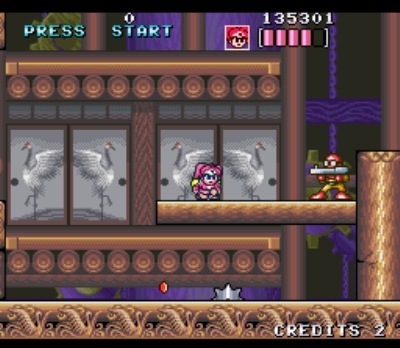 BS Kaizou Choujin Shubibinman Zero, or BS Shockman, or whatever you want to call it, is a quality 2-player affair. And that, my friends, is no BS. 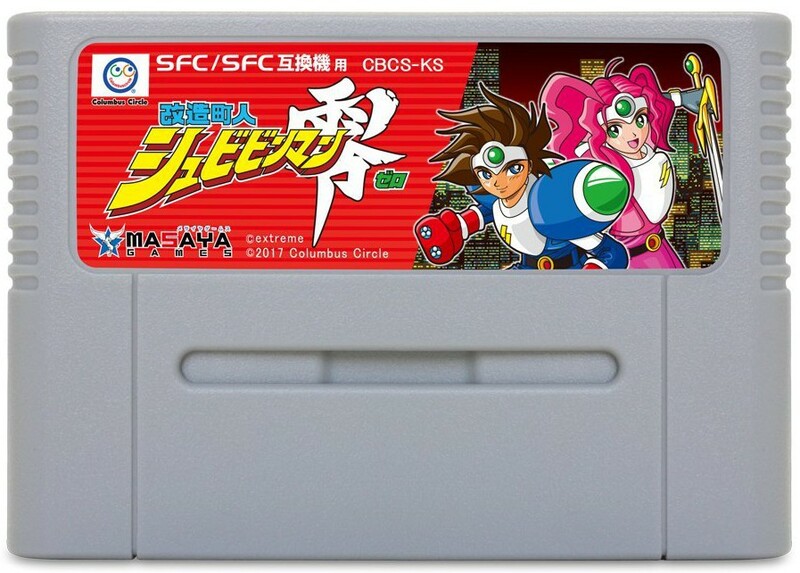 This game just got announced for an official SFC cartridge release in 2017. It’s up on Amazon Japan for pre-order. Wow, I didn’t know about this. Thanks for spreading the word! It’s a solid game definitely worth picking up, but not sure I’d drop $60+ on it, which it’s currently at. Then again, I’m kind of a tightwad, lol.